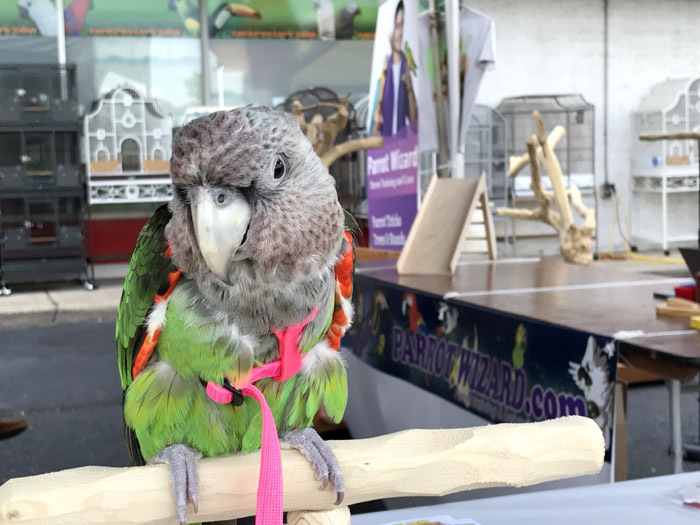 The weekend of September 9/10, 2017 was an exciting, action filled, time at Todd Marcus Birds Exotic in Delran, NJ. 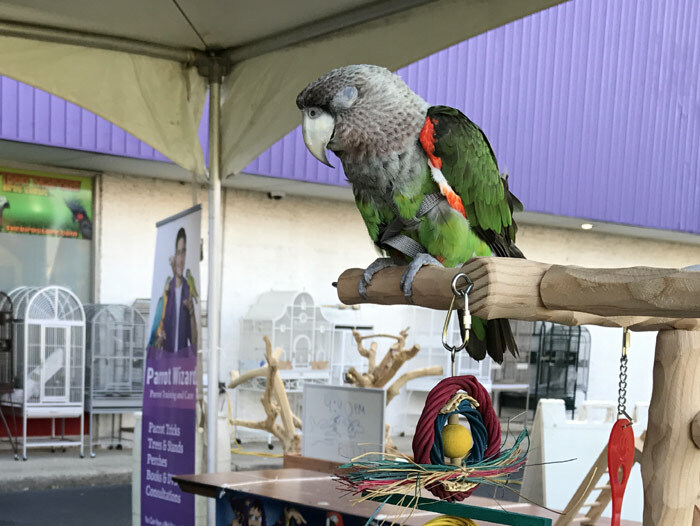 The exotic bird store held its biggest sale of the year during the 34th Anniversary event. 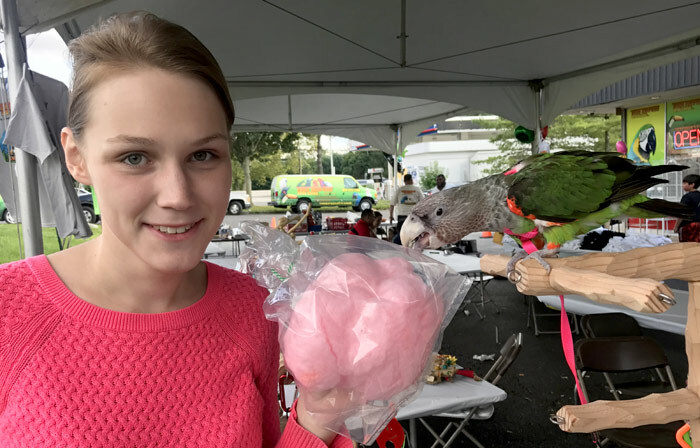 Parrot enthusiasts came from near and far to partake in the festivities. 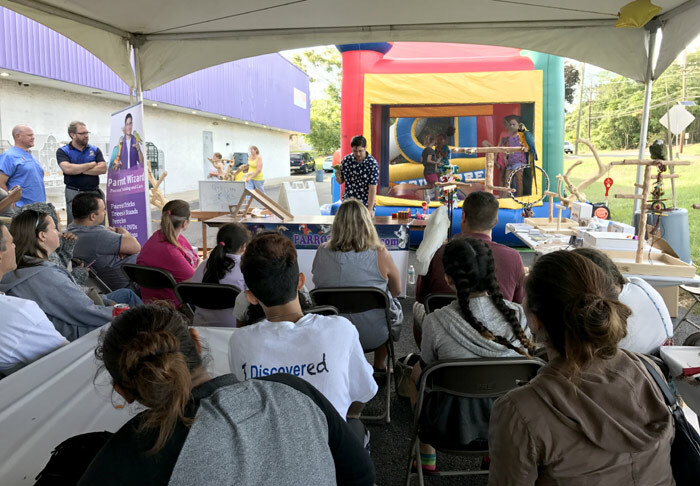 Face painting, free food, shopping, bird shows, and inflatable jumping pits for kids were just some of the featured activities. It seems that for most, the biggest highlight of the event was the social atmosphere. Folks sat around the store with baby birds in their arms while chatting with everybody. 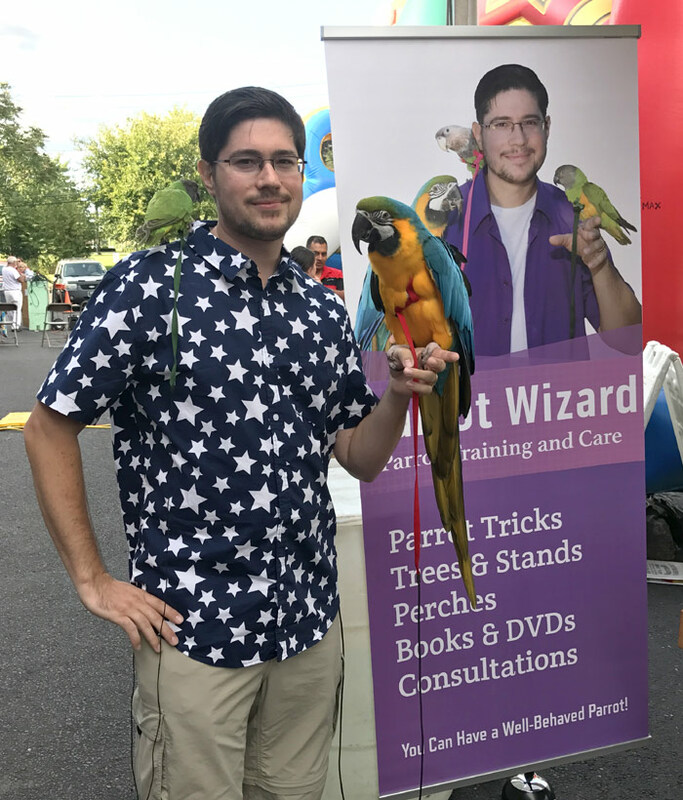 I was invited to hold bird shows, provide education, and showcase Parrot Wizard brand products. Kili, Truman, and Rachel helped me debut my new Parrot Wizard NU Perch Tree line. 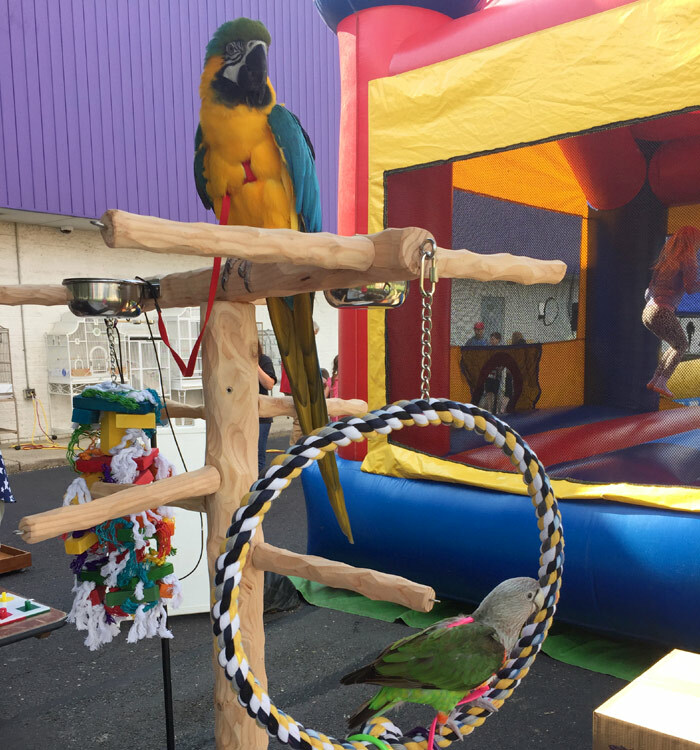 Since my performance area was outside, I kept all of my parrots harnessed for safety. Not surprisingly, they were not scared and handled very well. They have a lot of experience at even more bustling places. However, it is better safe than sorry, so they remained harnessed the entire time. This presented a slight challenge for Kili. Since she was the main star of the tricks show, she had to get around the table while dragging the leash behind her. It would have been no trouble at all except that she always manages to twist herself up in it. She always turns in the same direction, so with time it gets twisted up and I have to help her fix it. 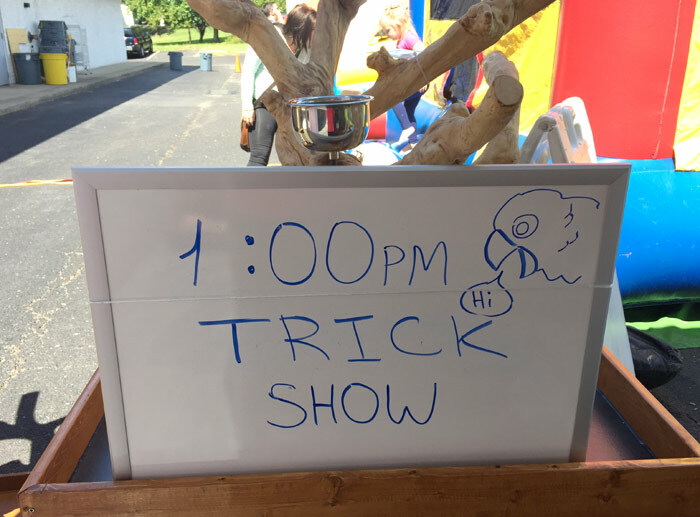 Otherwise, she has no trouble doing all of her tricks including bowling, color matching ring toss, and her baby stroller routine. I did not want to burden Kili with too many trick performances because we had to pace ourselves for 10 shows in 2 days. I tried to alternate other birds and talks in order not to overwhelm her. Well, she did all her shows and still had plenty of energy left to do more. I could hardly hold her back from jumping on the table and running to do tricks if she had the chance. She could have easily done even more than she was asked to. I found a good role for Truman as well. While Truman is a bit boneheaded when it comes to doing tricks, he has grown to be a pretty reliable talker in public. He knows how to say "Hey Cutie," "Kili," "Truman," and gives kisses on command. For 6 years, "Hey Cutie" was Truman's signature phrase. He was the only parrot that could say something long and cute on command. Well, a few months ago Kili learned to say "Hey Cutie" as well. The whole time Truman was supposed to be talking, Kili would echo anything he would say but louder and with greater clarity. Kili tries to be best at everything! Truman was good for a while but then he shut down. He almost fell asleep during one of the shows and then was seen with his eyes closed shortly after. Truman doesn't care. He can sleep through anything. Once he wants to do something, he just does. I guess it's just a Cape thing. Rachel spent most of her time in the "showroom." She sat around on the newly released Large NU Perch Tree to show how luxurious and sturdy it is. She spent the better part of 2 days straight harnessed on that tree and did very well. She was a bit nervous about the kids bouncing in the inflatable gym nearby. But as the day went on, she got comfortable and enjoyed her new perch paradise. These trees are now available on ParrotWizard.com. It was a pleasure getting to meet many fans at the event and sign so many books! And if you live in the NJ, PA, NY area and did not make it, there's always next year! 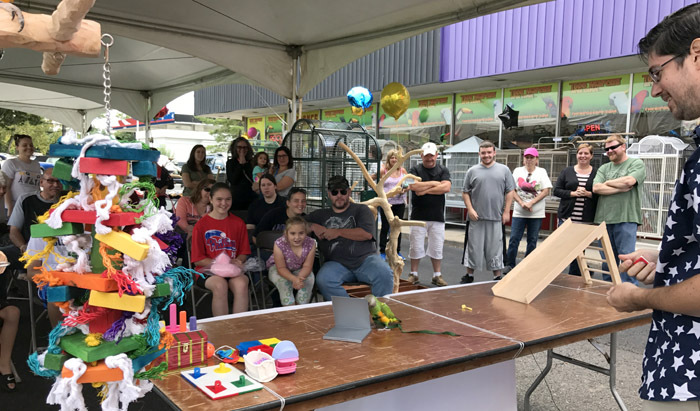 Come see the Parrot Wizard at the Todd Marcus 35th Anniversary Event in 2018.